The dried form of the grape revered throughout history, has its own unique name: raisin. They are about the size of small pebbles and have wrinkled skins. While the colours of raisins vary, they are generally a deep brown colour. 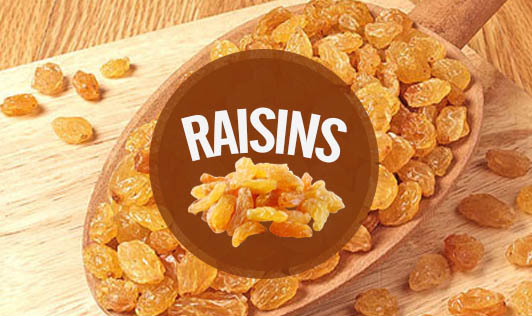 Like other dried fruit, raisins are a concentrated source of calories, sugar, and nutrients. They supply a healthy amount of dietary fibre, iron, potassium, and B vitamins. Raisins are an excellent snack for endurance athletes and for those who need to undergo prolonged physical exertion. They are beneficial for people with high blood pressure, fluid retention, constipation and anemia. The fibre in raisins promotes healthy bowel function and may help to protect against diseases of the digestive system. The phenols found in fruit have been shown to have antioxidant activity that helps prevent free radical damage to cells in the body. Raisins can be sprinkled over any breakfast cereal, hot or cold, or with yoghurt, fruit, vegetable or green salads. They are a great addition to breads, too. Raisins can be stored in the refrigerator in an airtight container to extend their freshness.